Tune in November 23 at 9:00 p.m. ET/PT to watch the broadcast premiere of the concert special “THE ALL-AMERICAN REJECTS” on AT&T* AUDIENCE Network via DIRECTV Ch 239. The show will also be available streaming on-demand through DIRECTV NOW and WatchTV. THE ALL-AMERICAN REJECTS are an American rock band from Stillwater, Oklahoma. The international rock stars are known for their hits “Move Along,” “Dirty Little Secret,” “Gives You Hell” and more. The band consists of Tyson Ritter (lead vocalist/bassist), Nick Wheeler (lead guitarist/backing vocalist), Mike Kennerty (rhythm guitarist/backing vocalist) and Chris Gaylor (drums). 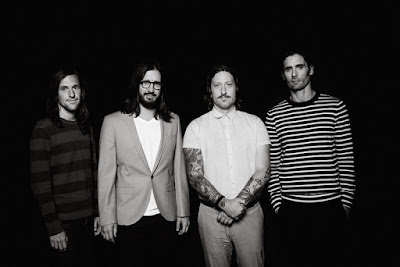 View the behind-the-scenes interview with AUDIENCE Music series host Ted Stryker and THE ALL-AMERICAN REJECTS as they describe growing up in the music industry HERE and HERE. AUDIENCE Network's music slate continues to deliver groundbreaking concerts, unique stories and exclusive performances across all genres, plus select programming in ultra high-definition/4K1, to audiences nationwide. Recent concert specials include: Taylor Swift, Garth Brooks, Keith Urban, Eric Church, Darius Rucker, Lady Antebellum, Sheryl Crow, CeeLo Green, Prophets of Rage, Hank Williams Jr., Fall Out Boy, Panic! at the Disco, 2 Chainz, The Lumineers, Cole Swindell, Kelsea Ballerini, Dan + Shay, Andra Day, Melissa Etheridge, Mac Miller, Brett Eldredge, Lukas Graham, Tinashe, JoJo, Bebe Rexha, Brandy Clark, Chris Janson, Daya, Machine Gun Kelly, Trey Songz, Lauren Alaina, Rae Sremmurd, William Michael Morgan, X Ambassadors, Sam Hunt, The Head and the Heart, Chris Lane, Andy Grammer, Rachel Platten, Charlie Worsham, 311, Bea Miller, All Time Low, Hanson, Neon Trees, Vic Mensa, Echosmith, Rick Ross, Korn, French Montana, Bishop Briggs, BØRNS, Vance Joy, Stone Temple Pilots, Sofi Tukker, Devin Dawson, Mikky Ekko, Jacob Banks, 21 Savage, Jason Mraz, Brothers Osborne, Noah Cyrus, DRAM, Goldfinger, Ne-Yo, Walker McGuire, Matt Nathanson, Cassadee Pope and others. AUDIENCE Network’s multiple series of original and exclusive performances give music fans an intimate view of music’s most influential artists today. The network collaborates directly with musicians to create a unique show from their perspective. THE ALL-AMERICAN REJECTS achieved mainstream success with their debut self-titled studio album The All-American Rejects, released in 2003. The album was certified platinum by the RIAA and spawned the single "Swing, Swing." The band's second studio album Move Along brought the group further mainstream success, producing the hit singles, "Dirty Little Secret," "Move Along" and "It Ends Tonight," all of which charted in the top fifteen on the Billboard Hot 100 chart, while Move Along was certified triple platinum by the RIAA. Their third studio album When the World Comes Down was released in 2008 and was later certified gold by the RIAA. Its lead single "Gives You Hell" became The All-American Rejects' most successful song to date, peaking at #4 on the Billboard Hot 100 chart and the top 5 in many other countries. "Gives You Hell" was certified 4× multi-platinum for sales of over 4 million in the United States by the RIAA. Kids in the Street, the band's fourth studio album, was released March 26, 2012 and debuted at number 18 on the US Billboard 200 chart. On October 30, 2015, the group released a new single named "There's a Place". THE ALL-AMERICAN REJECTS have sold over 10 million albums worldwide. They were named No. 183 on the "Billboard 200 Artists of the Decade" list. The group continues to tour worldwide and released their latest EP in 2017 titled Sweat. Always Original. Always Bold. Never Ordinary. AT&T AUDIENCE Network brings fresh, provocative content exclusively to DIRECTV, DIRECTV NOW, and WatchTV customers. It’s committed to pushing the envelope with a growing slate of critically acclaimed original series. Its latest lineup includes an adaptation of Stephen King’s “Mr. Mercedes” and conspiracy thriller “Condor.” Original comedies include “Loudermilk” and the industry-first polyamorous romcom “You Me Her.” AT&T AUDIENCE Network brings viewers real drama with its original documentaries “Give Us This Day” and “Alone In The Game” and intimate celebrity interviews on “Off Camera with Sam Jones.” “The Dan Patrick Show” and “The Rich Eisen Show” offer sports fans live, daily news from renowned sports journalists. And “Undeniable with Dan Patrick” puts viewers front row for in-depth chats with sports icons like Derek Jeter and Michael Phelps. Plus, music fans can see exclusive concerts by today’s hottest artists on AUDIENCE Music. It’s original entertainment you won’t see anywhere else. 1Limited titles available. Requires a Genie HD DVR (model HR54 or later) and a DIRECTV 4K Ready TV, or 4K TV connected to a 4K Genie Mini. Additional & advanced receiver fees apply. SELECT Package or higher and 4K account authorization required. Visit directv.com/4K for complete details. Other conditions apply. Add’l charges apply. 2Access via computer or app requires qualifying device and data connection. Access to content varies by device, TV plan, and viewing location. Data charges may apply.